Looking to turn dinner on its ear? Need a cool meal on a HOT day? 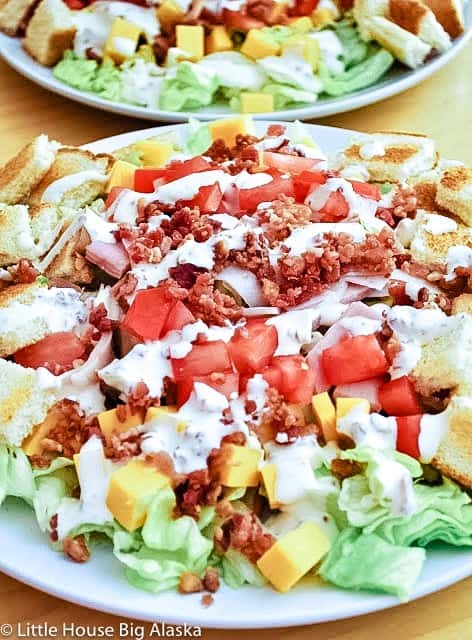 This Club Sandwich Salad with Bacon Dressing will do the job. 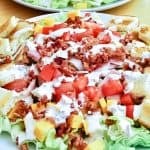 All the ingredients of a classic clubhouse sandwich piled on a big heap of lettuce gives you all the flavor combos you love in one big dinner salad. And Bacon Salad Dressing, need I say more? On a recent date night with my husband, we hit up the local hotel for some good old fashioned diner food. I normally go for the club sandwich but after a few beers (!!) and a nice long walk through town and a classic car show we were ready for big burgers instead of our usual. Dinner was fab! But the next day found me lamenting not enjoying my normal club sandwich, even though I thoroughly enjoyed date night and our matching burger situation. So I set out to create a refreshing and cool Club Sandwich Salad using all the ingredients for a sandwich but made into a nice big salad. It was a hit, there wasn’t any salad left when we were done. When I said I needed to make it again to just double check the dressing, I got exactly zero complaints. Looking to turn dinner on its ear? Need a cool meal on a HOT day? This Club Sandwich Salad with Bacon Dressing will do the job. Make the dressing first to give it time to settle, even better make it the day before and chill it well before using. Make necessary changes to suit your tastes and ingredients, I like Club Sandwiches with cheese so I added it to mine, you can too. This looks delicious! Thank you so much for including that bacon dressing recipe. I can't have mayo and always need suggestions on how to make a delicious dressing for all my summer salads. I am loving all your recipes and this is perfect for the hot Alaska weather we are having right now. My family gets bored of the usual old salads so I think I will be making a few of yours to liven things up a bit. Thank you so much. I really want to make this. This summer has been too hot to cool!!! Your recipe is confusing. You’ve got everything bunched together. You mention milk for the dressing, but there is no milk mentioned in the ingredients. You’re right it was confusing! Sorry about that. I updated my site and put my recipes in a recipe site. Some just didn’t convert right and some lost ingredients. I updated it. While I was looking at it. Thanks for letting me know. Basically, I left out a 1/4 cup of milk in the conversion. If you like a thinner dressing use more milk. Cheers!